Subscribe to the Great War Reenactor List -- This list is for Great War Reenactors on both sides. It is the original Great War list and whilst there are other specialty lists out there, it still has the most members. If you're a Great War reenactor, or want to be one or are even just a WWI buff, please feel free to join! WW1 Westfront -- This is a list for those who reenact WW1 on the West Coast of the United States. All sides are covered here and we hope it will allow the hobby to grow. WW1 East Front -- Group for fostering the growth of Reenacting, collecting, and historical discussion of the First World War in Eastern Europe until the end of the Russian Civil War 1914-1923. Subscribe to the WW1-G Mailing List -- This list is for Great War Imperial German Reenactors. Mit Gott, für König und Vaterland! Both reenactors and collectors are welcomed on this list. All that is really required is an interest in the Imperial German Military. 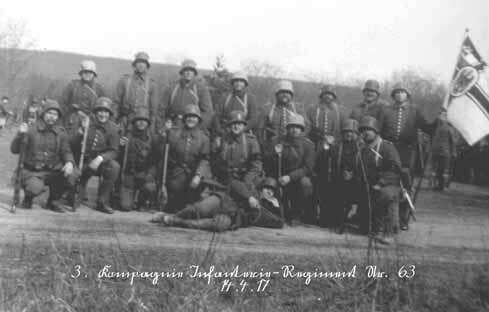 KUK1914-1918 -- A gathering place for those interested in the Austro-Hungarian Army in the First World War. A place to share ideas, pictures and information. A place for anyone interested in gaining or sharing knowledge and information. Reenactors, living historians, collectors all are welcome. Great War Poilu -- This group is for anyone interested in reenacting part of the French Armed forces in WW1. You can expect to find information on uniforms and vendors as well as general histories and how to improve ones impression. The hope is that this list can provide a start for the many French Reenactors out there. The WWI Belgian list! Yep, they were there and here is a list for all of you who are Belgian fans (BTW, Paul Schipper is now reproing the uniforms and kit...). WW1-Italiano -- A list for those who are interested in the Italian soldier of the Great War. Especially those who wish to reenact this impression! If you're intrested in this often-overlooked Army, please consider joining us! Over There -- This is an informal group for the discussion of and to create growth and interest in recreating the American Soldier in the Great War. Our focus is in particular the role of the individual Yank/Doughboy/Sammie his uniform, equipment, weapons and life in and out of the trenches. Currently, we have a really great listing of sutlers here. These businesses are the best, so please visit them and tell 'em you saw it on reenactor.Net! If you have a reenactor vendor link you want on this page, please visit our Vendor Info Page. Lost Battalions--Lost Battalions is the maker of unparalleled reproduction WWI uniforms. From their excellent patterns, to their custom-made wool, Lost Battalions provides their customers with outstanding service. As I myself have a Lost Battalions uniform, I can vouch for their quality! Hessen Antique -- Hessen Antique is a small family owned business offering original militaria and museum quality reproductions for collectors and reenactors. We also provide costume and military technical support to film and theater productions. Please have a look at our products and feel free to Email us with any questions about our products or services. Check out our new line of WWI uniforms and equipment! We carry a full line of authentic uniforms, headgear and equipment. Most models of WWI and WWII Visor Caps and Field Caps are either in stock or available. Our hats are custom made in Germany just like the originals and are the most authentic and high quality caps available. Here are the main WWI Great War Parent Organizations. They are the ones who put on the events. Check 'em out. This page contains links to many good sites that we find relevant on the 'Net. They are in no particular order, but look for us to have more quality links soon, and if you have a cool link related to WWI or German stuff that you'd like to see here, please contact e-mail me Marsh Wise. Avishai Halevy's Images Home Page featuring collections of images from France. . The Historic Iron Cross 1813 - 1957: A great page about the history of the Iron Cross. This page has many links and is a good resource! The Ernst Jünger Home Page. This site is all about Ernst Jünger, the acclaimed author of Im Stahl Gewittern (Storm of Steel) and many other books. The Pickelhaube Page - If early war German uniforms are of interest to you, then this page is for you. This is probably the most complete site on the web that features the Pickelhaube (spiked helmet). Has tons of pictures and information on this type of headgear. FEEFHS Map Room: German Empire - East (1882) - Silesia, Prussia (234K) - A web site that has a map of Silesia, Prussia from 1882. Student US Historians' Views of the Great War and its causes. The Lost Poets of the Great War--World War I; by Harry Rusche. Trenches on the Web: Lots of great articles on many different WWI subjects--without a doubt, one of the BEST sites on the Great War. Versailles Treaty - This is for the true die-hard of the Great War; an electronic copy of the Versailles Treaty. The Great War - Web site created for the PBS television special. Has a lot of great information about the special and the Great War. Collecting Militaria .... Before 1919 - A site devoted to teaching about collecting militaria. Has articles on many aspects of collecting. Images of World War I: the Western Front (part of the Rosenberg site). Great War in the Air; The Smithsonian Institute--National Air/Space Museum's WWI Flight Gallery. Flying Circle Graphics Home Page.- Primarily a flying page with some cool graphics. 6000 Volkslieder: German and other Folksongs. Frank Petersohn's EXCELLENT web page--he has zillions of German folk songs and marching songs, not only the lyrics, but in many cases, there are MIDI files to go along with them. 97% of all the song stuff on this site comes from Frank's site--he graciously allows me to use these songs. One of the nicest people you will find on the net, Frank does not limit his page to only German songs either, there are folksongs and national anthems from around the world here. For sure, check it out!! Marsh's favourite beer (so he insists on this link): Budvar Budweiser!--The TRUE King of Beers! Unfortunately, Budvar is not available in the United States due to a bunch of legal chicanery (Boo! Hiss!). Some day, some way though, we will see Budvar here... Anyway, check them out! Deutsch für Reisende is a web site designed to help you learn German. Vermissten und Toten Datenbank - A very "dark" but interesting web site. This site in German and is linked to databases that have all of the German casualties of World War I and II. Skat--A site that contains a shareware version of the popular German card game, Skat. It's not the easiest game to figure out but if you are truly a "Hun" then the challenge of learning and playing the game will be perfect for you. This was very popular with the Soldaten. If you would like to have a link to your web page here, please first visit our "Wanna Link?" page, add the code you find there and then e-mail me with your URL. I will check it out and see if it fits with our topics. What, you may be asking is a "Morsel of Authenticity"? Well, it simply is a term Marsh came up with to mean a short article on some reenacting subject. As time goes by, we hope to add more and more of these articles. In fact, right now, this is the only Morsel page working on reenactor.Net! Right now, we have five good articles for your information. NOW, before someone starts to spaz, the reason these articles are all GERMAN-related is because that is what was sent it or found. If you have a good article about some ALLIED subject, well... SEND IT IN! Fine-Tuning your German Uniform--The first of these excellent articles was done by Steve Fisher of J.R. 111 and is a truly revealing article on how to make your uniform much more authentic. Making a Felt Pickelhaube--by Mike Gonzales of J.R. 23. This detailed article will guide the reader into making a usable Spiked Helmet. Das Ersaztwesen (or, the Replacement System)--by Louis Plack, J.R. 459. An enlightening article on Germany's system of the Draft (read right before bedtime). On The Home Front; The Production and Use of Ersatz Goods--by Marc Benedict of J.R. 120. Wow! This article explains the many innovations forced upon the Germans during the war. "Make do" was a way of life then!